Enhancing the Intelligence of storage tanks and process vessels with some of the most advanced communication technology and sensing equipment available. 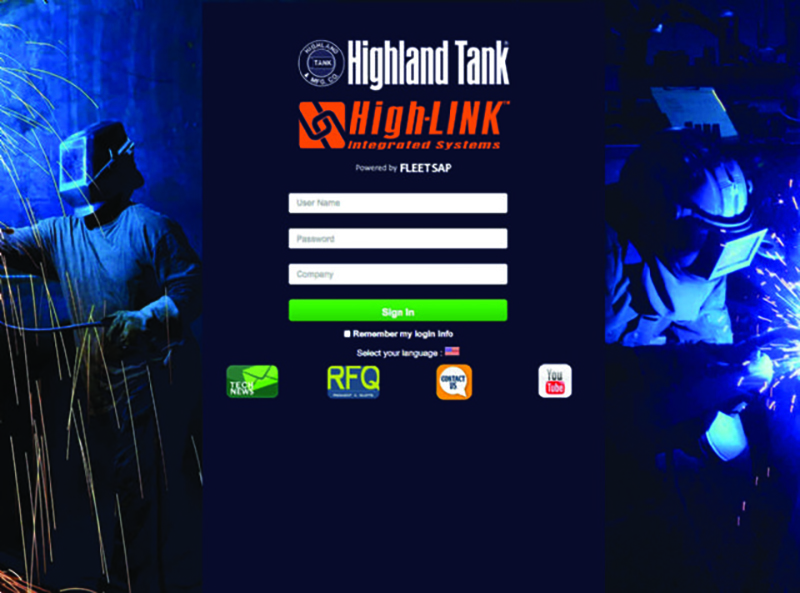 Highland Tank is now enhancing the intelligence of our products with integrated monitoring systems. Our new High-LINKTM integrated systems couple superior steel tank products with state-of-the-art electronic management devices and software, providing real-time data to optimize any liquid transfer and use operation. Highland Tank will provide all the sensors, hardware, and software customized specifically for your applications to manage, monitor, and control operations at fixed, remote, and mobile sites. With the High-LINKTM app on your mobile device, monitoring is just a click away – anytime, day or night. The High-LINKTM systems are tailored to your needs to manage and monitor storage tank inventories, temperatures, delivery accuracy, service and maintenance needs. High-LINKTM provides a network operating center for your equipment, vehicle fleets, fuel tanks, water, and wastewater systems. Data is transmitted in real time to identify insights for immediate decision making. This critical data can include transaction date and time, current product level, change in product level, duration of continuous change, amount of product in and out, product level alerts, transaction location, date and time. It is available anywhere, any time, on any device. These systems help monitor and manage all of your liquid storage and processes – providing peace-of-mind 24/7. Wireless remote monitoring allows for volume monitoring, temperature monitoring, and delivery verification. RFID tags provide GPS tank location tracking and prevent fuel waste or theft by stopping fueling the second the nozzle is removed from the tank. Fixed video surveillance system provides live footage to your monitoring center. Preset alerts are sent via e-mail or text and notify the user of critical low level for refueling and order fuel automatically upon approval. This real time data also helps your business save costs with preventative and predictive maintenance. Our High-LINKTM Monitoring Center can track your business operations. Notifications on the performance of all aspects of your operation at multiple levels can improve the efficiency and effectiveness of any business model. Give us a call to discuss how these systems can work for you.